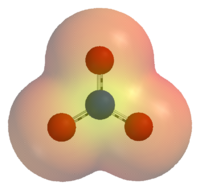 An electrostatic potential map of the nitrate ion. Areas colored red are lower in energy than areas colored yellow. In inorganic chemistry, a nitrate is a salt of nitric acid characterized by a negatively charged ion composed of one nitrogen atom bound to three oxygen atoms. In organic chemistry, the term nitrates refers to the esters of nitric acid and various alcohols. Nitrates play significant roles in our lives and in the rest of the natural world. In particular, they form an important source of nitrogen for plant growth, and therefore for other organisms that derive their nutrition from plants. We use nitrates for a variety of purposes, including fertilizers, food preservatives, medicine, and explosives. On the down side, the excessive use of nitrate-containing fertilizers has led to pollution of groundwater and surface waters in various agricultural regions, with adverse effects on aquatic life. In addition, there is concern that ammonium nitrate may be used to make explosives for terrorist activities. 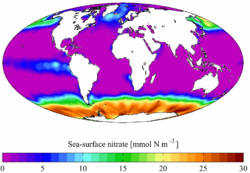 Annual mean sea surface nitrate for the World Ocean. Data from the World Ocean Atlas 2001. Solid nitrates are not very abundant in nature as they are very soluble. They can appear where nitrogen-containing groundwater is evaporating (such as in soils of arid regions and on animal shed walls). Nitrification bacteria in the soil are also needed for the process. The first commercially exploited source was India, providing the British Empire with a reliable supply. By contrast the European continental powers had to collect scrapings from walls and barns, install saltpeter farms (based on aging and leaching manure and urine). The chemist Lavoisier was also a tax collector and commissioner of the Saltpeter Administration. Later, the large deposits of sodium nitrate in the Atacama Desert of northern Chile acquired economic significance. Until the early part of the twentieth century, there were no known methods for the chemical synthesis of nitrates. Chile was a major exporter, and European countries were dependent on its nitrates for use as fertilizer to feed their people. Nitrates were needed to produce military explosives as well. These two uses influenced world history in significant ways. Had the Germans not devised the Haber and Ostwald processes for producing nitrate, they would not have been able to feed their civilian population and armies, nor continued to make explosives. The First World War might have ended as a direct result of embargo of essential raw materials. With the aid of organic chemistry, however, the war continued. Nowadays, most nitrates are produced from ammonia synthesized from atmospheric nitrogen. The structure and charge of the nitrate ion. The structure may also be represented in the form of the diagram on the right. 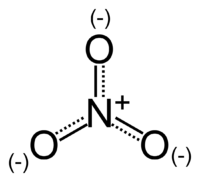 The nitrate ion is the conjugate base of nitric acid. A nitrate salt forms when a positively charged ion (such as a metal ion) attaches to the negatively charged oxygen atoms of the ion, forming an ionic compound. Almost all nitrates are soluble in water at standard temperature and pressure. In freshwater or estuarine systems close to land, nitrate concentrations can reach high levels, potentially causing the death of fish. Although the nitrate ion is much less toxic than ammonia or nitrite, levels over 30 parts per million (ppm) of nitrate can inhibit growth, impair the immune system, and cause stress in some aquatic species. In most cases, high nitrate concentrations in aquatic systems are the result of surface runoff from agricultural or landscaped areas that have received excess nitrate fertilizer. These levels of nitrate can also lead to algal blooms, and when nutrients (such as potassium, phosphate, or nitrate) become limiting, eutrophication can occur. Besides leading to water anoxia, these blooms may cause other changes to ecosystem functions, favoring some groups of organisms over others. Consequently, as nitrates form a component of total dissolved solids, they are widely used as indicators of water quality. Ammonium nitrate (NH4NO3) is commonly used in agriculture as a high-nitrogen fertilizer. It can also be used as an oxidizing agent in explosives, especially improvised explosive devices. Potassium nitrate (KNO3) is a naturally occurring mineral source of nitrogen. Its common names include saltpeter (saltpetre), nitrate of potash, and nitre. It is used in the production of nitric acid, model rocket propellants, and several types of fireworks. In addition, it is a fertilizer and food preservative. Although also used in gunpowder, it is not combustible or flammable by itself. Sodium nitrate (NaNO3) is a type of salt that has long been used as an ingredient in explosives and solid rocket propellants, in glass and pottery enamel, and as a food preservative (such as in hot dogs), and has been mined extensively for these purposes. It is also variously known as caliche, Chile saltpeter, saltpeter, and soda niter. Chile has the largest reserves of caliche. It can also be manufactured synthetically. Silver nitrate (AgNO3) is a soluble salt of silver and a corrosive compound. It produces a gray or black stain on skin. As a light-sensitive material, it is used in preparing photographic film. It is also used in making silver-based explosives and in staining biological samples for research. In addition, it has been used in medicine for its antiseptic properties. Nitrates should not be confused with nitrites, the salts of nitrous acid. Organic compounds containing the nitro (NO2) functional group are known as nitro compounds. ↑ Black, Alvin P., and Frank H. Babers. "Methyl Nitrate." Organic Syntheses 2 (1943): 412; 19 (1939): 64. Methyl Nitrate Retrieved September 13, 2007. ↑ Snyder, H.R., et al., "Imidazole." Organic Syntheses 3 (1955): 471; 22 (1942): 65. Imidazole Retrieved September 13, 2007. This page was last modified on 15 January 2015, at 17:10.